Acute kidney injury (AKI) is a well-recognized iatrogenic sequela of intravascular iodinated contrast media administration. 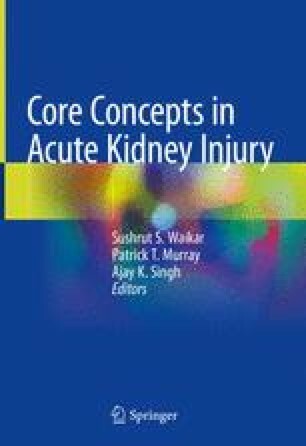 The incidence of contrast-associated acute kidney injury (CA-AKI) varies depending on the threshold change in kidney function used to define renal injury and the clinical characteristics and risk profile of the patient population. CA-AKI typically manifests as relatively small, transient decrements in kidney function that occur within 2–4 days of contrast administration. A growing number of studies suggest that this condition is associated with serious adverse outcomes, including death and accelerated longer term loss of kidney function; however, the causal nature of these associations remains unknown. This is important as recent data demonstrate that indicated contrast-enhanced procedures are not performed in some patients with chronic kidney disease, likely out of concern by providers for the development of CA-AKI. CA-AKI is one of the few potentially preventable forms of renal injury; as a result, there has been substantial interest in identifying strategies to reduce the risk of this condition. Past research of multiple pharmacological and non-pharmacological interventions forms the current evidence basis for the prevention of this condition. Given an aging patient population, growing prevalence of chronic kidney disease and diabetes, and increasing reliance on diagnostic and therapeutic procedures that utilize intravascular iodinated contrast, AKI is likely to remain a common complication of iodinated contrast. As a result, it is essential for providers caring for patients undergoing contrast-enhanced procedures to recognize the risk factors for, outcomes associated with, and evidence basis for the prevention of this iatrogenic condition.